The FBI assessed last year that it was “reasonably likely” that Hillary Clinton’s private email server had been infiltrated by hostile foreign actors. He noted the recent revelations about Peter Strzok, the FBI agent who was a central figure in both the Clinton email probe and Trump investigations. Strzok was discovered to have sent anti-Trump and pro-Clinton text messages to FBI lawyer Lisa Page while he was overseeing both investigations. Strzok conducted the most important interviews in the Clinton investigation. He interviewed Clinton herself on July 2, 2016 and also met with the Democrat’s top aides, Huma Abedin and Cheryl Mills. Strzok is also believed to have softened some of the language in Comey’s statement. CNN has reported that he removed the legalistic term “grossly negligent” and replaced it with “extremely careless.” Gross negligence in the handling of classified material is a crime. The edits to Comey’s statement “raise profound questions about the FBI’s role and possible interference in the 2016 presidential election and the role of the same agents in Special Counsel Robert Mueller’s investigation of President Trump,” Johnson wrote to Wray. The edits were made after Comey sent a draft of his remarks on May 2, 2016 to Deputy FBI Director Andrew McCabe, general counsel James Baker and chief of staff James Rybicki. On May 16, 2016, McCabe sent the draft to Strzok and several other counterintelligence agents asking for edits. In addition to softening the language regarding intrusion of Clinton’s server by foreign actors, Comey’s draft was edited to remove language that suggested that she and her aides broke the law. The rough draft stated that the private server violated “the statute proscribing gross negligence in the handling of classified information” as well as of the statute regarding “misdemeanor mishandling” of classified information. Clinton’s opponents have long speculated that her email server was hacked. Though there was no public evidence that the device was ever breached, Republicans said that Clinton’s carelessness ensured that it was. That possibility made it all the more troubling that Clinton flouted federal regulations to operate a private server, they argued. Passage from Sen. Ron Johnson’s Dec. 14, 2017, letter to FBI Director Christopher Wray. Comey’s public statement was much easier on Clinton. 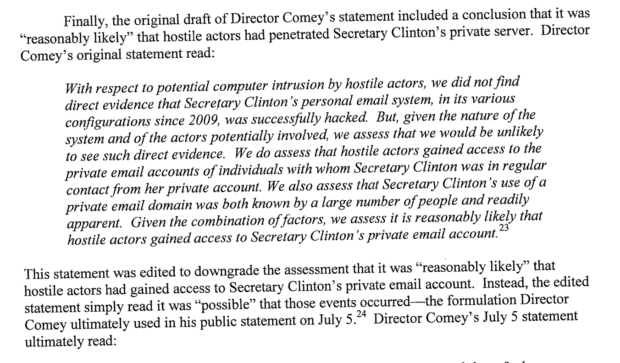 “Given that combination of factors, we assess it is possible that hostile actors gained access to Secretary Clinton’s personal e-mail account,” he said. In his letter, Johnson asked Wray to provide information about which FBI officials made changes to Comey’s statement.